Note: If you came to this page expecting to sign up for a website, then head to the login page and follow the instructions. You’ll be set up in a few minutes. If you need more information and help, read on! UNF Faculty Domains is a project at the University of North Florida managed by the Center for Instruction and Research Technology (CIRT). It is a full featured web hosting solution that offers the opportunity to create academic publishing spaces using modern web applications. This project is one of many “Domain of One’s Own” projects happening at institutions of higher learning across the country. 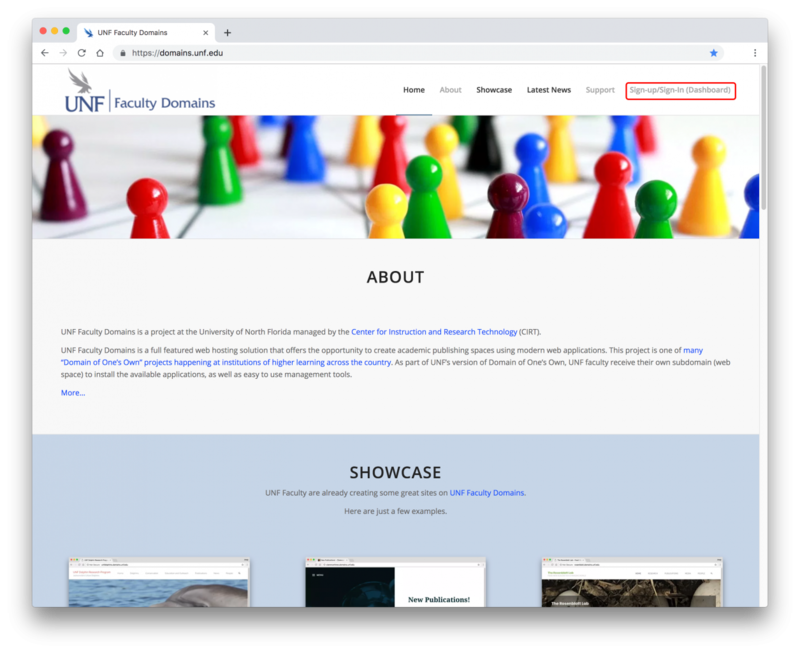 As part of UNF’s version of Domain of One’s Own, UNF faculty receive their own subdomain (web space) to install the available applications, as well as easy to use management tools. These faculty domains can function as hubs for professional presence. The service provides both simple templates for common needs and more sophisticated tools and support for faculty who wish to experiment. If you are not sure what a domain is, the “What is a Domain?” article may help. 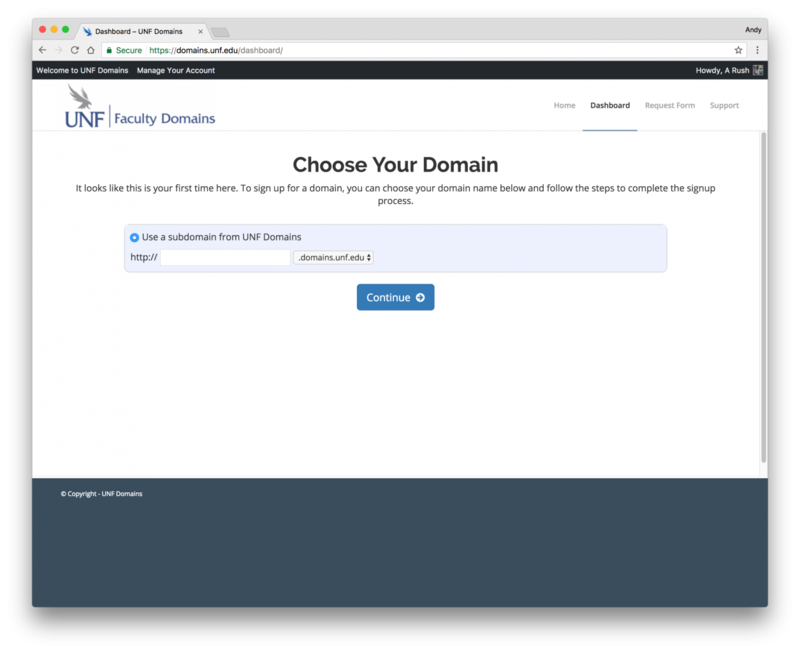 If you are brand new to the world of UNF Faculty Domains, you may not know what you need to do to start using it. So to begin, you first need to select a domain name that will look something like yourdomain.domains.unf.edu. That is what we refer to as signing up. After you have signed up and have selected your domain (you only sign up ONCE), you will subsequently sign in. To sign up or sign in you will go to https://domains.unf.edu and click on the Sign-in/Sign-up (Dashboard) link in the menu bar (upper right corner of that page). After you have selected your domain name, and you sign in, you will see what is known as the Control Panel or cPanel screen. 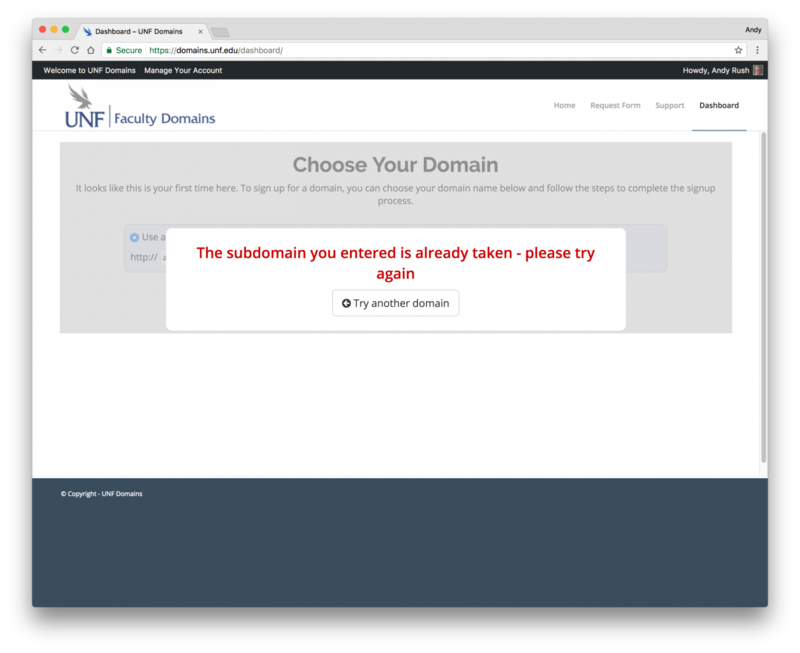 Your Domain Name Must Be Available – The most common choice for UNF Faculty Domains will probably be your first and last name. Choosing a domain that includes your name may make it easier for you to achieve higher rankings in search engines when someone queries your real name. This is not a requirement, but also realize that there might be more than one John Smith for instance. Be prepared with another option. Choose a Domain You Can Live With: You should choose a domain name that you feel you can live with for quite some time. Pick a Domain you Like: At the end of the day, your domain should reflect you. Pick a domain you like and are proud of. If not your name, your domain can reflect your interests, the name of a project, or a hobby. Or it could just be your name. The “right” domain for you is the one you’re comfortable with. You Have the Option of a Personal Domain Name – Once you create your space, you can use a more personal domain name, like andyrush.com. You will need to purchase it for about $15/year, and continue to renew it each year if you want to keep it. We have more information on Registering a Domain. Once you’ve given your domain name some thought, you can go to https://domains.unf.edu and click on the Sign-in/Sign-up (Dashboard) link in the menu bar (upper right corner of that page). 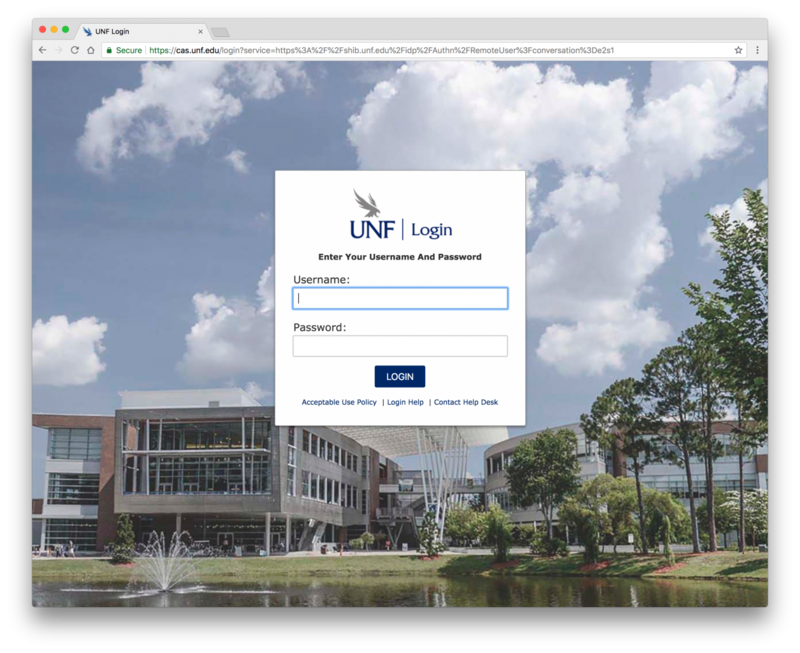 If you are logged in to myWings or another UNF web service, you will be brought directly to the Chose your Domain screen. Otherwise, you will be redirected to login where you will use your UNF username and password to login. After you log in with your username, you will be brought to the Choose Your Domain page. Type in the domain name you would like to use. Just enter your domain name in the field and the system will take care of the rest. Again, it will take the form of http://yourdomain.domains.unf.edu – Click the Continue button. Click on the Sign Up button if you want to keep the domain. Click on the Start Over button if you’d like to choose a different domain name. You’ll eventually see a Congratulations screen which will count down from 10 and then redirect you to your domain’s control panel. If it all worked correctly, what you’ll see next is what’s known as the Control Panel or cPanel. From now on when you sign in at https://domains.unf.edu (by clicking on the Sign-in/Sign up (Dashboard) link), you will see the cPanel page. 4.What Can You Do with Your Account? Your ability to do things on UNF Faculty Domains is dictated to a large degree by the limits of your imagination. That said, you’re now staring at a bunch of unfamiliar icons and you don’t know what they do. So let’s take it from the top and install a web application. WordPress: WordPress is a blogging application. While it allows you to quickly and easily set up a blog, it also comes with a set of features that really make it possible to set up any kind of basic Web site without much difficulty. We have resources available that are focused on installing and using WordPress. We strongly recommend that you use WordPress, if this is the first time you are installing an application on a domain. Scalar: Scalar is a free, open source authoring and publishing platform that’s designed to make it easy for authors to write long-form, born-digital scholarship online. Scalar enables users to assemble media from multiple sources and juxtapose them with their own writing in a variety of ways, with minimal technical expertise required. Omeka: Omeka is a good choice if you’re looking for a way to publish digital collections in your web space. 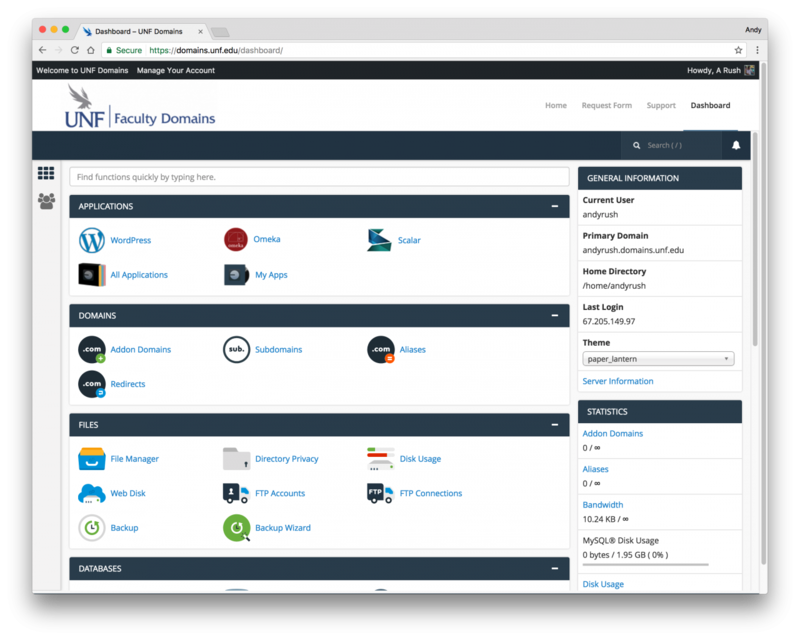 It’s also a quick install through Installatron in cPanel onto your UNF Faculty Domains web space. You are able to install more than one application on your domain. You can even install multiple versions of each application. One easy way to organize your domain is to create subfolders for your site (which can also have their own application installed in them). These are just examples of ways to organize your site and then use different sections to do different things. There is no one solution to this challenge, and what you do should be driven by what makes sense to you. To start, you may just want to install one thing at the “root” of your domain, and then let the rest evolve as you get to know more about what’s possible. 5.What Exactly is a Web Application? The system we use for UNF Faculty Domains uses a special script installer called Installatron (in cPanel). When you use Installatron, you don’t need to worry about moving files, creating databases, or doing the initial configuration. It’s all taken care of for you. You can find out more about Installatron here. In order to run on the UNF Faculty Domains server, web applications must be able to run on a LAMP server, which is the particular kind of web server that we use. Occasionally, a web application may require additional components or modules that need to be installed on the server.